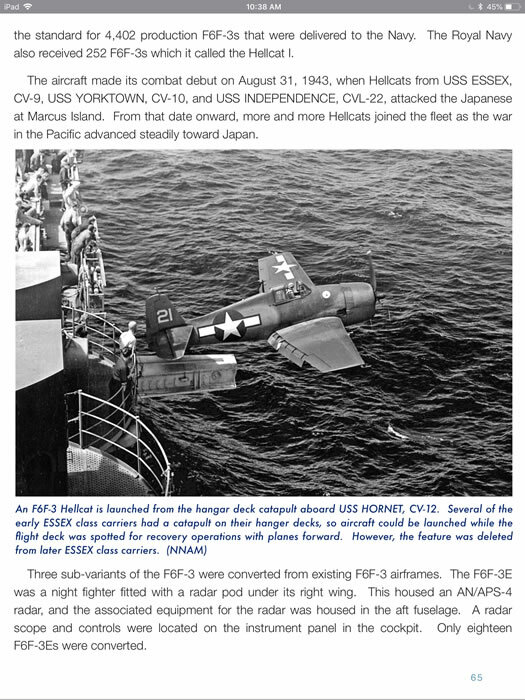 Detail and Scale US Navy and Marine Carrier Based Aircraft of WWII - Digital Volume 6 Review by Floyd S. Werner Jr. This digital book is awesome, as are the rest of the Detail & Scale digital books. The latest Detail & Scale Digital Book is going to be very popular with the model builder. Authors Bert Kinzey and Rock Roszak have done a great job again. This book is slightly different than past Detail & Scale books in that it covers numerous aircraft. Using it in the digital format allows you to browse the ‘book’ like you would any hard copy book by swiping left or right. The alternative method is to use the Table of Contents. Find the aircraft that you want to visit and touch the screen and you are taken directly to the beginning of the chapter. It’s that simple. Once you get to the chapter that you want you can use the bottom of the page to go to a direct page. You can swipe left or right and browse the chapter until you get to where you want. One of the big benefits of the digital format is the ability of the author to add content to make sure your ‘book’ is always up to date. Another benefit is the unlimited color photos that can be included. Have a picture that you wish you could see larger? Just touch it and it will expand to up to 200 times. You can’t do that with a ‘real’ book. The Navy has been using aircraft since 1922 with the commissioning of the USS Langley. They had to develop techniques that were unique for the Navy. Things like takeoff, landing and recovery of aircraft at sea. Once these and other techniques were developed it was just a matter of expanding and improving them as well as the aircraft. 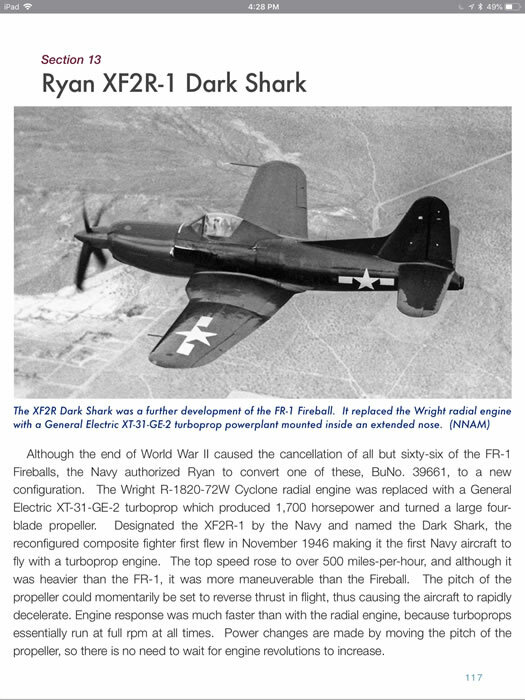 Aircraft were specially developed to be fighters, dive bombers and torpedo planes. Each carrier had its own compliment of aircraft. By the time America entered the war, Wildcats, Dauntless and Devastators were woefully outclassed. 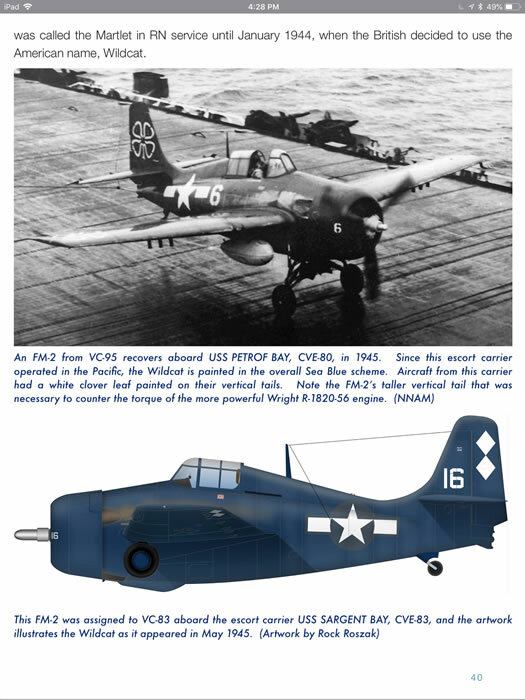 These aircraft were replaced as the war progressed with Hellcats, Corsairs, Helldivers and Avengers. In addition to these aircraft there were plenty of test aircraft. 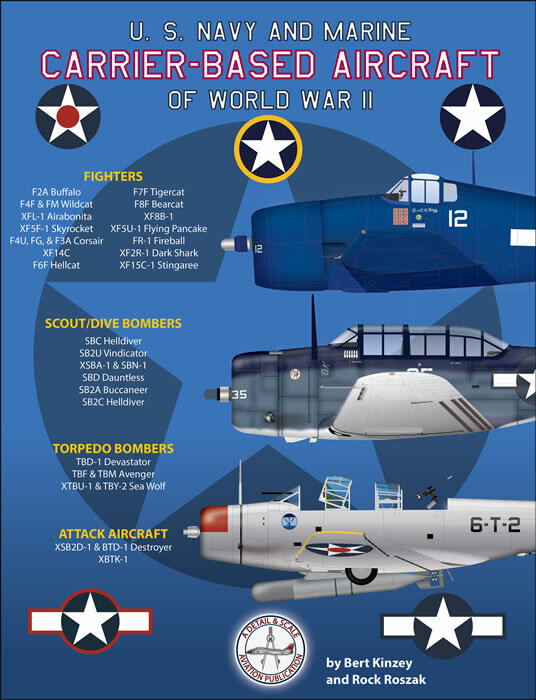 All of these aircraft and their markings are included in this digital book. 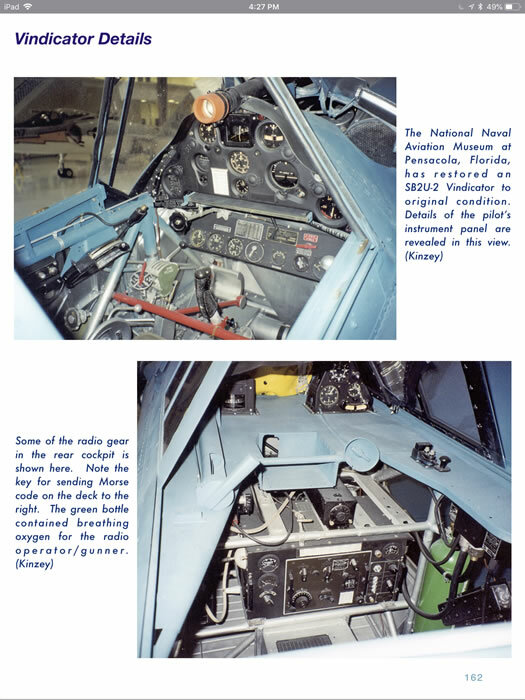 Most aircraft sections include cockpit photos that will be invaluable to modelers. The book starts off with the 14 Fighters. All aircraft that made it to the flying prototype stage are included. 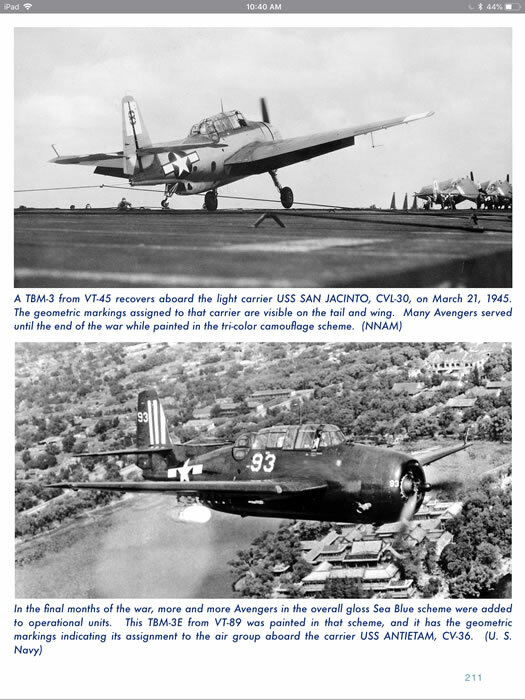 Fighters include the Buffalo, Wildcat, Hellcat and Corsair. Other fighters are the Bearcat and Tigercat. 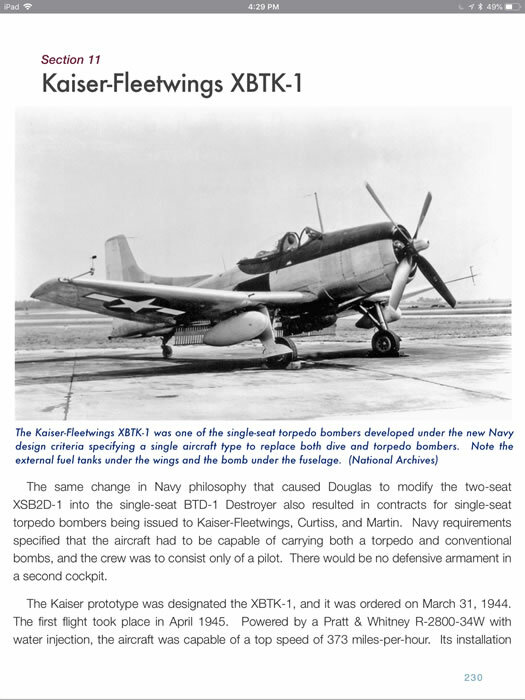 Some test aircraft designed for the Navy including the Bell XFL-1 Airabonita, XF5F-1 Skyrocket, XF5U-1 Flying Pancake, Curtiss XF14C, Boeing XF8B-1, Ryan XF2R-1 Dark Shark, and Fireball and the XF-15C Stingaree are included. Dive and Torpedo Bombers are in the next section. 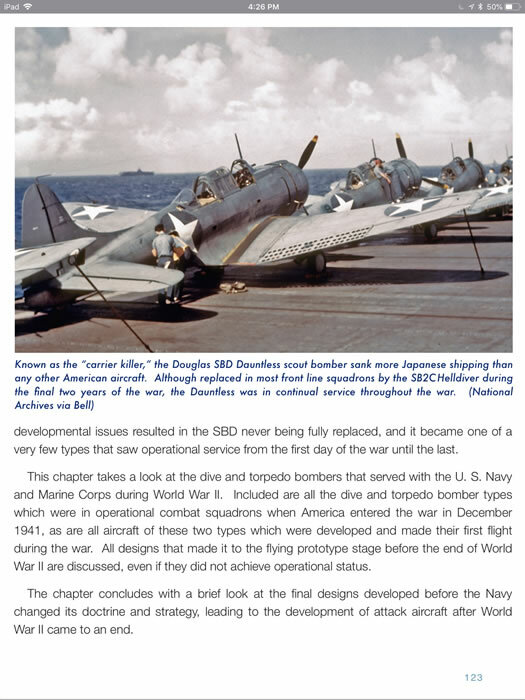 Of course, there is more coverage of the Dauntless, Avenger and Helldiver. 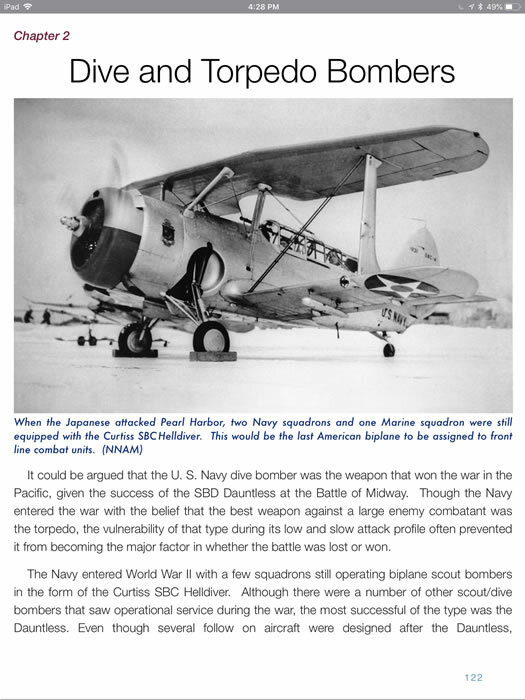 The Curtiss SBC Helldiver, as seen in the movie, ‘Helldiver’, is the first one covered. This biplane led the way for the rest. 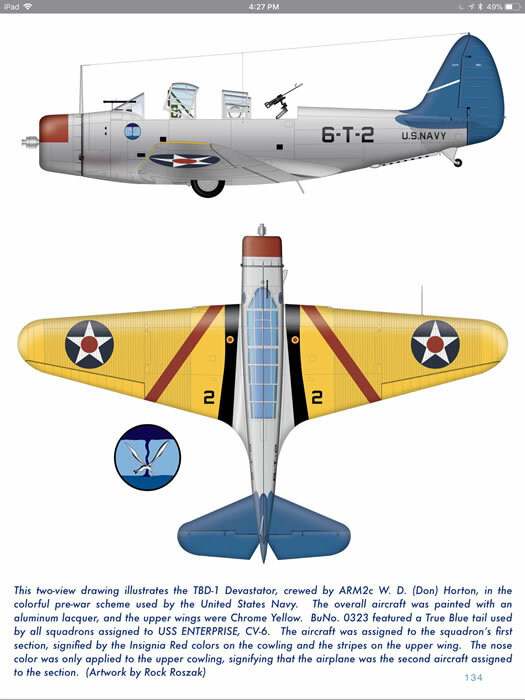 The TBD Devastator is covered in significant detail as is the Vindicator. 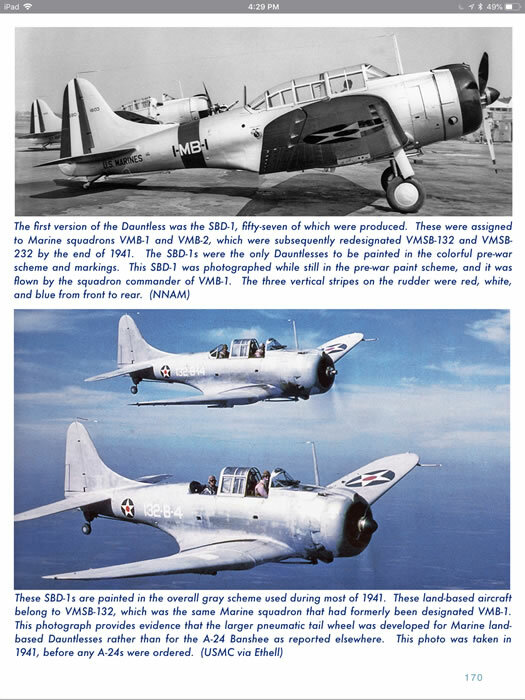 This is followed by the Slow But Deadly, SBD Dauntless and its replacement aircraft the SB2C Helldiver. The Brewster XSBA-1, SBN-1 and Buccaneer are shown as are the Sea Wolf. Don’t know what they are? Neither did I, but I know now. The Douglas Destroyer and Kaiser-Fleetwings XBTK-1 round out the Dive and Torpedo bombers. Appendix 1 shows the Theater Maps along with Capital Ship losses. 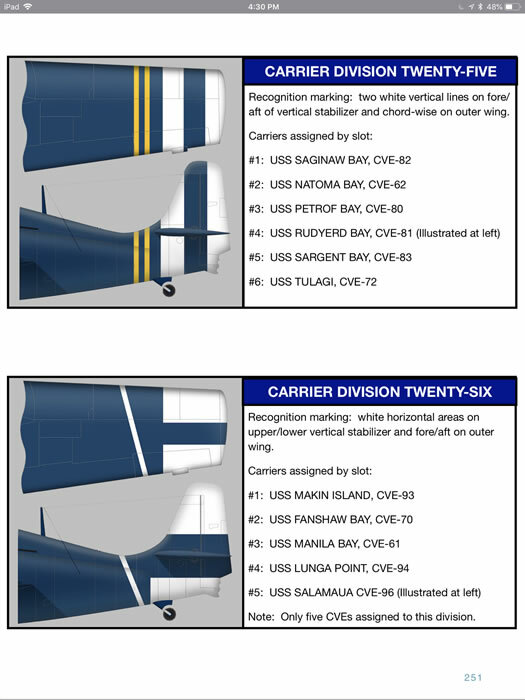 Appendix 2 has the Navy Paint Schemes and Markings. This explains the typical paint schemes applied to identify aircraft. 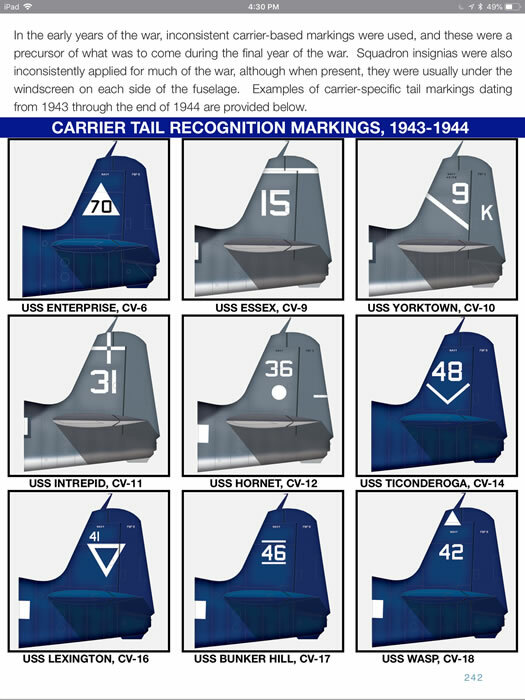 Carrier Tail Markings are also included. Also addressed is the evolution of the United States Aircraft National Insignia. This is a great one stop shop reference. Is it perfect? No, I would have liked more photos of the cockpits and detail but that is beyond the scope of this ‘book’. 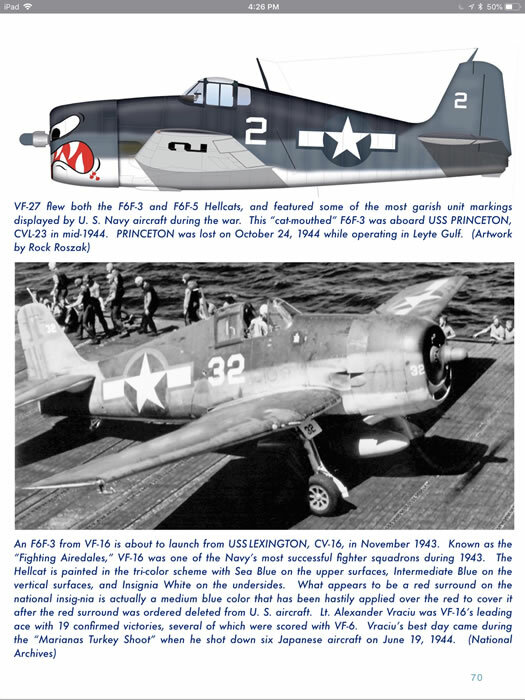 This book is a great reference for Navy aircraft, both production and prototype aircraft. The primary aircraft used during the war are covered adequately. The ability to enlarge the photos makes this a great resource. The profiles are really well done and will provide inspiration for the model builder. This is another great release from Detail & Scale. 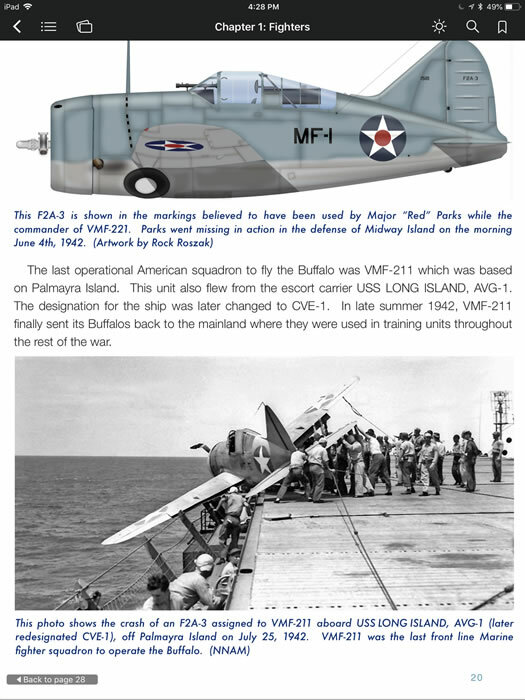 If you have even a passing interest in aircraft of the Navy and Marines this is a great digital book. Thanks to Detail & Scale or the sample.